What are the Consequences of Applying for Two Credit Cards in One Week? Will the borrower(s) be able and willing to repay the monies they have borrowed? Before the advent of the credit-scoring algorithm, lenders qualitatively assessed a borrower’s ability to repay using the outmoded techniques of ‘word of mouth’, or their own history dealing with the borrower, if that was available. Modern lenders now use quantitative methods instead, based upon comprehensive data analyses that generate credit scores. Are Lenders Required to Report Borrower Data to the Credit Required? The reality is that in the realm of credit reporting, the reporting of data to the credit repositories is more complex than you can imagine. It is also significant to note that creditors are under no obligation to report financial data to the bureaus. In fact, credit unions and small lenders often choose to not report data. It is also important to note that the borrowers mis-perceive the fact that creditors report borrower payment histories (among other data) at the beginning of each month. The Bottom Line: Lenders are not required to report to the credit bureaus or to report at the beginning of the month. Which Credit Bureaus Receive Borrower Information? Creditors employ a customary structure when reporting to the big three credit bureaus that include Equifax, Transunion and Experian. So, if a creditor chooses to report, when do Credit Card Companies Report to Credit Bureaus? A creditor has full control as to when they report. Some lenders choose to report at the end, the beginning or even the middle of the month. There are some lending institutions that choose to report more than once per month.Not knowing when your creditor reports, is a handicap to those proactively trying to raise or recover their credit scores. This is because if you pay your balance in full each month, but it was paid after the reporting date, your credit score will reflect the outstanding debt – even if the account was paid in full and on time. Finally, it is more than challenging to out guess your creditor’s reporting policies. And while you can call to ask about their reporting policy, they are under no obligation to reveal the information. And if they choose to tell you, the creditor’s reporting policies are subject to change, without notice! When you open a new account, each lender begins to report about this new account information according with their own rules. This is especially frustrating for those borrowers attempting to establish (or re-establish) a credit history. As a general rule though, a creditor reports a new account 30 days after the date the borrower remits their first payment. The most prudent move to overcome this time delay is to use your new account immediately and then to remit your first payment as soon as possible. The sooner the first payment hits the lender’s financial system, the quicker you’ll find your new account reported to the credit repositories. Although not every bank follows this routine, most do. As most of us know, creditors consistently report late payments of 30 days, and more. A payment that is 30 days late is considered a minor delinquency. Minor delinquencies will impact a score on a temporary basis, IF the account returns to an ‘as agreed’ status soon after. Major late payments are more serious and impact a credit score for a longer period of time. Some view credit cards as a handy financial tool. Others mistakenly use them to pay for purchases that they probably should not have been made. And while a revolving balance on a credit card appears somewhat insignificant when compared to the financial world of mortgages, venture capital, or construction financing, it can reek havoc on your credit score. Revolving balances can negatively impact your score even without a solitary late payment. Credit card balances that exceed 10% of the credit card’s limit begin to reduce a credit score. Its impact accelerates as it nears the card’s limit. The reality is that a card that is maxed out, can negatively impact a score by as much as 100 points – contingent upon the rest of the credit profile. And if you have three, or more cards, the impact is even more significant. It is not that uncommon to see a score hover in the 600’s without any collections or late payments. It is simply due to balance(s) that meet (or exceed) a credit limit. It is suggested that consumers maintain no more than three revolving accounts; with balances below 10% of the limit. If this is not possible, ask for a credit limit increase to help reduce your utilization ratio; to raise your score. The Bottom-line: The timing of the reporting of data from a lender to a credit bureau is important to understand because if you can pay down the higher utilization ratio credit cards. This one simple step just might be enough to qualify for additional credit. This is one of the most important reasons to find out: When do credit card companies report to credit bureaus? A credit report is chock-full of information related to your past credit history. The contract you sign with a creditor is a reflection of the information to the lender upon application. If you fulfill your obligations under this contract, your credit score will reflect this. But if you don’t, a creditor has a right to voluntarily report this information. Our current, comprehensive credit reporting system works efficiently and streamlines the process between creditors and consumers. Lenders seek to provide precise information when reporting because ultimately, this improves their decision-making process in terms of time and in making sound financial decisions. 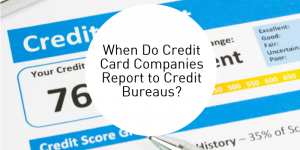 If you are a consistent late payer, “when do credit card companies report to credit bureaus”, is the wrong question to be asking. Revise the question and ask – ‘How can I start paying on time.’ If you must know “when do credit card companies report to credit bureaus”, the answer is: According to their own policies, and every 30-days, or so, depending on if the usual reporting day falls on a holiday or a weekend.